Thanks to a mission extension, NASA’s Juno probe continues to orbit Jupiter, being only the second spacecraft in history to do so. Since it arrived around the gas giant on July 5th, 2016, Juno has managed to gather a great deal of information on Jupiter’s atmosphere, magnetic and gravity environment, and its interior structure. In that time, the probe has also managed to capture some breathtaking images of Jupiter as well. But on December 21st, during the probe’s sixteenth orbit of the gas giant, the Juno probe changed things up when four of its cameras captured images of the Jovian moon Io, showcasing its polar regions and spotting what appeared to be a volcanic eruption. In July of 2016, the Juno spacecraft established orbit around Jupiter, becoming the first spacecraft since the Galileo probe to study the planet directly. 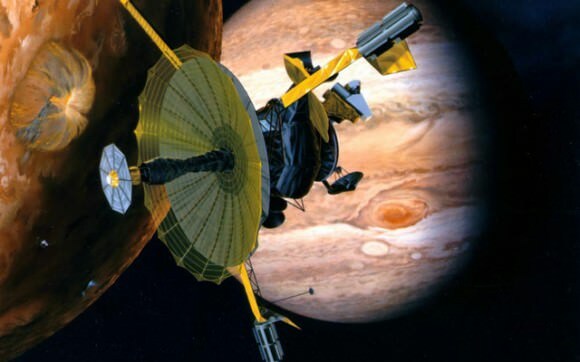 Since that time, the probe has been sending back vital information about Jupiter’s atmosphere, magnetic field and weather patterns. With every passing orbit – known as perijoves, which take place every 53 days – the probe has revealed more exciting things about this gas giant. The gas giant Jupiter, which was named in honor of the king of the gods in the Roman pantheon, has always lived up to its name. In addition to being the largest planet in the Solar System – with two and a half times the mass of all the other planets combined – it also has an incredibly powerful magnetic field and the most intense storms of any planet in the Solar System. What’s more, it is home to some of the largest moons in the Solar System (known as the Galilean Moons), and has more known moons than any other planet. And thanks to a recent survey led by Scott S. Sheppard of the Carnegie Institution of Science, twelve more moons have been discovered. This brings the total number of known moons around Jupiter to 79, and could provide new insight into the history of the Solar System. The team was led by Scott S. Sheppard and included Dave Tholen (University of Hawaii) and Chad Trujillo (Northern Arizona University). It was this same team that first suggested the existence of a massive planet in the outer reaches of the Solar System (Planet 9 or Planet X) in 2014, based on the unusual behavior of certain populations of extreme Trans-Neptunian Objects (eTNOs). The initial discoveries were made using the Blanco 4-meter telescope at the Cerro Tololo Inter-American Observatory (CTIO) in Chile. They were then confirmed with the help of the Dark Energy Camera (DECam), which was added to the Blanco telescope as past of the Dark Energy Survey. Additional data was provided by the Carnegie Observatories 6.5-meter Magellan Telescopes. As you can see from the image above, two of the newly-discovered moons (indicated in blue) are part of the inner group that have prograde orbits (i.e. they orbit in the same direction as the planet’s rotation). They complete a single orbit in a little less than a year, and have similar orbital distances and angles of inclination. This is a possible indication that these moons are fragments of a larger moon that was broken apart, possibly due to a collision. Nine of the new moons (indicated in red) are part of the distant outer group that have retrograde orbits, meaning they orbit in the opposite direction of Jupiter’s rotation. These moons take about two years to complete a single orbit of Jupiter and are grouped into three orbital groups that have similar distances and inclination. As such, they are also thought to be remnants of three larger moons that broke apart due to past collisions. The team observed one other moon that does not fit into either group, and is unlike any known moon orbiting Jupiter. This “oddball moon” is more distant and more inclined than the prograde moons and takes about one and a half years to orbit Jupiter, which means its orbit crosses the outer retrograde moons. Because of this, head-on collisions are much more likely to occur with the retrograde moons, which are orbiting in the opposite direction. Here too, the team thinks that this moon could be the remains of a once-larger moon; in this case, one that had a prograde orbit that formed some of the retrograde moons through past collisions. The oddball moon already has a suggested name for it – Valetudo, after the Jupiter’s great-granddaughter, the goddess of health and hygiene in the Roman pantheon. In addition to adding to Jupiter’s overall moon count, the study of what shaped these moon’s orbital histories could teach scientists a great deal about the earliest period of the Solar System. For instance, the fact that the smallest moons in Jupiter’s various orbital groups (prograde, retrograde) are still abundant suggests that the collisions that created them occurred after the era of planet formation. According to the Nebular Hypothesis of Solar System formation, the Sun was still surrounded by a rotating protoplanetary disk at this time – i.e. the gas and dust from which the planets formed. Because of their sizes – 1 to 3 km – these moons would have been more influenced by surrounding gas and dust, which would have placed a drag on their orbits and caused them to fall inwards towards Jupiter. The fact that these moons still exist shows that they likely formed after this gas and dust dissipated. In this respect, these moons are much like time capsules or geological records, preserving pieces of Jupiter’s (and the Solar Systems) history of formation and evolution. This research was partially funded by a NASA Planetary Astronomy grant, and was made possible thanks to assistance by multiple observatories. These included the 4-meter Discovery Channel Telescope at Lowell Observatory Arizona, the 8-meter Subaru Telescope and the University of Hawaii’s 2.2 meter telescope, and the 8-meter Gemini Telescope in Hawaii.